There’s been a flurry of discussion around the idea of syncronicity in free software projects. I’d like to write up a more comprehensive view, but I’m in Prague prepping for FOSSCamp and the Ubuntu Developer Summit (can’t wait to see everyone again!) so I’ll just contribute a few thoughts and responses to some of the commentary I’ve seen so far. Robert Knight summarized the arguments I made during a keynote at aKademy last year. I’m really delighted by the recent announcement of that the main GNOME and KDE annual developer conferences (GUADEC and aKademy) will be held at the same time, and in the same place, in 2009. This is an important step towards even better collaboration. Initiatives like FreeDesktop.org have helped tremendously in recent years, and a shared conference venue will accelerate that process of bringing the best ideas to the front across both projects. Getting all of the passionate and committed developers from both of these into the same real-space will pay dividends for both projects. Aaron Seigo of KDE Plasma has taken a strong position against synchronized release cycles, and his three recent posts on the subject make interesting reading. Aaron raises concerns about features being “punted” out of a release in order to stick to the release cycle. It’s absolutely true that discipline about “what gets in” is essential in order to maintain a commitment on the release front. It’s unfortunate that features don’t always happen on the schedule we hope they might. But it’s worth thinking a little bit about the importance of a specific feature versus the whole release. When a release happens on time, it builds confidence in the project, and injects a round of fresh testing, publicity, enthusiasm and of course bug reports. Code that is new gets a real kicking, and improves as a result. Free software projects are not like proprietary projects – they don’t have to ship new releases in order to get the money from new licenses and upgrades. We can choose to slip a particular feature in order to get a new round of testing and feedback on all the code which did make it. Some developers are passionate about specific features, others are passionate about the project as a whole. There are two specific technologies, or rather methodologies, that have hugely helped to separate those two and empower them both. They are very-good-branching VCS, and test-driven development (TDD). We have found that the developers who are really focused on a specific feature tend to work on that feature in a branch (or collaborative set of branches), improving it “until it is done” regardless of the project release cycle. They then land the feature as a whole, usually after some review. This of course depends on having a VCS that supports branching and merging very well. You need to be able to merge from trunk continuously, so that your feature branch is always mergeable *back* to trunk. And you need to be able to merge between a number of developers all working on the same features. Of course, my oft-stated preference in VCS is Bazaar, because the developers have thought very carefully about how to support collaborative teams across platforms and projects and different workflows, but any VCS, even a centralised one, that supports good branches will do. So, branch-friendly VCS’s and test-driven development make all the difference. Work on your feature till it’s done, then land it on the trunk during the open window. For folks who care about the release, the freeze window can be much narrower if you have great tests. There’s a lot of discussion about the exact length of cycle that is “optimal”, with some commentary about the windows of development, freeze, QA and so on. I think that’s a bit of a red herring, when you factor in good branching, because feature development absolutely does not stop when the trunk is frozen in preparation for a release. Those who prefer to keep committing to their branches do so, they scratch the itch that matters most to them. I do think that cycle lengths matter, though. Aaron speculates that a 4-month cycle might be good for a web site. I agree, and we’ve converged on a 4-month planning cycle for Launchpad after a few variations on the theme. The key difference for me with a web site is that one has only one deployment point of the code in question, so you don’t have to worry as much about update and cross-version compatibility. The Launchpad team has a very cool system, where they roll out fresh code from trunk every day to a set of app servers (called “edge.launchpad.net”), and the beta testers of LP use those servers by default. Once a month, they roll out a fresh drop from tip to all the app servers, which is also when they rev the database and can introduce substantial new features. It’s tight, but it does give the project a lot of rhythm. And we plan in “sets of 4 months”, at least, we are for the next cycle. The last planning cycle was 9 months, which was just way too long. I think the cycles-within-cycles idea is neat. Aaron talks about how 6 months is too long for quick releases, and too short to avoid having to bump features from one cycle to the next. I’ve already said that a willingness to bump a feature that is not ready is a strength and not a weakness. It would be interesting to see if the Plasma team adopted a shorter “internal” cycle, like 2 months or 3 months, and fit that into a 6 month “external” cycle, whether Aaron’s concerns were addressed. For large projects, the fact that a year comes around every, well, year, turns out to be quite significant. You really want a cycle that divides neatly into a year, because a lot of external events are going to happen on that basis. And you want some cohesion between the parts. We used to run the Canonical sprints on a 4-month cycle (3 times a year) and the Ubuntu releases on a six month cycle (twice a year) and it was excessively complex. As soon as we all knew each other well enough not to need to meet up every 4 months, we aligned the two and it’s been much smoother ever since. Some folks feel that distributions aren’t an important factor in choosing an upstream release cycle. And to a certain extent that’s true. There will always be a “next” release of whatever distribution you care about, and hopefully, an upstream release that misses “this” release will make it into the next one. But I think that misses the benefit of getting your work to a wider audience as fast as possible. There’s a great project management methodology called “lean”, which we’ve been working with. And it says that any time that the product of your work sits waiting for someone else to do something, is “waste”. You could have done that work later, and done something else before that generated results sooner. This is based on the amazing results seen in real-world production lines, like cars and electronics. So while it’s certainly true that you could put out a release that misses the “wave” of distribution releases, but catches the next wave in six months time, you’re missing out on all the bug reports and patches and other opportunities for learning and improvement that would have come if you’d been on the first wave. Nothing morally wrong with that, and there may be other things that are more important for sure, but it’s worth considering, nonetheless. Some folks have said that my interest in this is “for Canonical”, or “just for Ubuntu”. And that’s really not true. I think it’s a much more productive approach for the whole free software ecosystem, and will help us compete with the proprietary world. That’s good for everyone. And it’s not just Ubuntu that does regular 6-month releases, Fedora has adopted the same cycle, which is great because it improves the opportunities to collaborate across both distributions – we’re more likely to have the same versions of key components at any given time. Let’s assume project A depends on B, and B releases at the same time as A. That means that A is either going to be one cycle behind B in using what B provides, or will have to track B’s bleeding edge for the latter part of their cycle allowing some usage. What you really want is a staggered approach where B releases right about when A starts to work on things. This goes completely counter to the “everyone on the same month, every 6 months” doctrine Mark preaches, of course. I have never suggested that *everyone* should release at the same time. In fact, at Ubuntu we have converged around the idea of releasing about one month *after* our biggest predictable upstream, which happens to be GNOME. And similarly, the fact that the kernel has their own relatively predictable cycle is very useful. We don’t release Ubuntu on the same day as a kernel release that we will ship, of course, but we are able to plan and communicate meaningfully with the folks at kernel.org as to which version makes sense for us to collaborate around. Rather than try and release the entire stack all at the same time, it makes sense to me to offset the releases based on a rough sense of dependencies. Just to be clear, I’m not asking the projects I’ll mention below to change anything, I’m painting a picture or a scenario for the purposes of the discussion. Each project should find their own pace and scratch their itch in whatever way makes them happiest. I think there are strong itch-scratching benefits to syncronicity, however, so I’ll sketch out a scenario. Imagine we aimed to have three waves of releases, about a month apart. In the first wave, we’d have the kernel, toolchain, languages and system libraries, and possibly components which are performance- and security-critical. Linux, GCC, Python, Java, Apache, Tomcat… these are items which likely need the most stabilisation and testing before they ship to the innocent, and they are also pieces which need to be relatively static so that other pieces can settle down themselves. I might also include things like Gtk in there. In the second wave, we’d have applications, the desktop environments and other utilities. AbiWord and KOffice, Gnumeric and possibly even Firefox (though some would say Firefox is a kernel and window manager so… ;-)). And in the third wave, we’d have the distributions – Ubuntu, Fedora, Gentoo, possibly Debian, OpenSolaris. The aim would be to encourage as much collaboration and discussion around component versions in the distributions, so that they can effectively exchange information and patches and bug reports. I’ll continue to feel strongly that there is value to projects in getting their code to a wider audience than those who will check it out of VCS-du-jour, keep it up to date and build it. And the distributions are the best way to get your code… distributed! So the fact that both Fedora and Ubuntu have converged on a rhythm bodes very well for upstreams who can take advantage of that to get wider testing, more often, earlier after their releases. I know every project will do what suits it, and I hope that projects will feel it suits them to get their code onto servers and desktops faster so that the bug fixes can come faster, too. Stepping back from the six month view, it’s clear that there’s a slower rhythm of “enterprise”, “LTS” or “major” releases. These are the ones that people end up supporting for years and years. They are also the ones that hardware vendors want to write drivers for, more often than not. And a big problem for them is still “which version of X, kernel, libC, GCC” etc should we support? If the distributions can articulate, both to upstreams and to the rest of the ecosystem, some clear guidance in that regard then I have every reason to believe people would respond to it appropriates. I’ve talked with kernel developers who have said they would LOVE to know which kernel version is going to turn into RHEL or an Ubuntu LTS release, and ideally, they would LOVE it if those were the same versions, because it would enable them to plan their own work accordingly. So let’s do it! Finally, in the comments on Russell Coker’s thoughtful commentary there’s a suggestion that I really like – that it’s coordinated freeze dates more than coordinated release dates that would make all the difference. Different distributions do take different views on how they integrate, test and deploy new code, and fixing the release dates suggests a reduction in the flexibility that they would have to position themselves differently. I think this is a great point. I’m primarily focused on creating a pulse in the free software community, and encouraging more collaboration. If an Ubuntu LTS release, and a Debian release, and a RHEL release, used the same major kernel version, GCC version and X version, we would be able to improve greatly ALL of their support for today’s hardware. They still wouldn’t ship on the same date, but they would all be better off than they would be going it alone. And the broader ecosystem would feel that an investment in code targeting those key versions would be justified much more easily. An update on the long term plans for Ubuntu release management. 8.04 LTS represented a very significant step forward in our release management thinking. To the best of my knowledge there has never been an “enterprise platform” release delivered exactly on schedule, to the day, in any proprietary or Linux OS. Not only did it prove that we could execute an LTS release in the standard 6-month timeframe, but it showed that we could commit to such an LTS the cycle beforehand. Kudos to the technical decision-makers, the release managers, and the whole community who aligned our efforts with that goal. 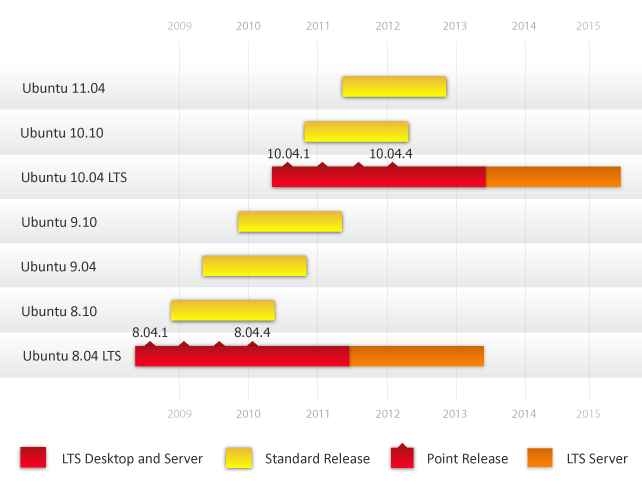 As a result, we can commit that the next LTS release of Ubuntu will be 10.04 LTS, in April 2010. This represents one of the most extraordinary, and to me somewhat unexpected, benefits of free software to those who deploy it. Most people would assume that precise release management would depend on having total control of all the moving parts – and hence only be possible in a proprietary setting. Microsoft writes (almost) every line of code in Windows, so you would think they would be able to set, and hit, a precise target date for delivery. But in fact the reverse is true – free software distributions or OSV’s can provide much better assurances with regard to delivery dates than proprietary OSV’s, because we can focus on the critical role of component selection, integration, testing, patch management and distribution rather than the pieces which upstream projects are better able to handle – core component feature development. This is in my mind a very compelling reason for distributions to focus on distribution – that’s the one thing they do which the upstreams don’t, so they need to invest heavily in that in order to serve as the most efficient conduit of upstream’s work. We also committed, for the first time, to a regular set of point releases for 8.04 LTS. These will start three months after the LTS, and be repeated every six months until the next LTS is out. These point releases will include support for new hardware as well as rolling up all the updates published in that series to date. So a fresh install of a point release will work on newer hardware and will also not require a big download of additional updates. The Ubuntu team does an amazing job of ensuring that one can update from release to release, and from LTS release to LTS release directly, too. I’m very proud to be part of this community! With the addition of some capability to support newer hardware in LTS releases, I think we are doing our part in the free software community – helping to deliver the excellent work of thousands of other teams, from kernel.org to GNOME and KDE, safely to a huge audience. There’s one thing that could convince me to change the date of the next Ubuntu LTS: the opportunity to collaborate with the other, large distributions on a coordinated major / minor release cycle. If two out of three of Red Hat (RHEL), Novell (SLES) and Debian are willing to agree in advance on a date to the nearest month, and thereby on a combination of kernel, compiler toolchain, GNOME/KDE, X and OpenOffice versions, and agree to a six-month and 2-3 year long term cycle, then I would happily realign Ubuntu’s short and long-term cycles around that. I think the benefits of this sort of alignment to users, upstreams and the distributions themselves would be enormous. I’ll write more about this idea in due course, for now let’s just call it my dream of true free software syncronicity.